Hello friends,Here is a list of all my premium themes that were released. 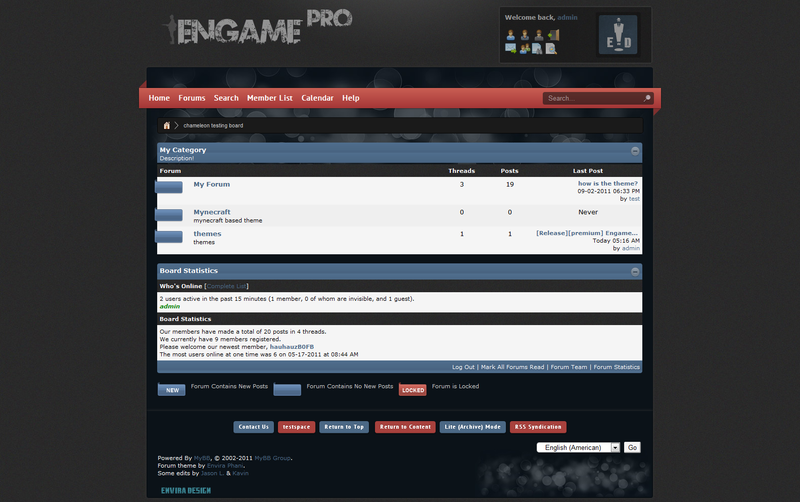 This is a really a day to remember for me as my first Premium theme, "Engame series" is going to be released. Its coding took a little longer than expected,and now its tested on may demo boards and each code scanned in zoom for bugs and finally we release a clean product,the beauty " Engame-Gamer". 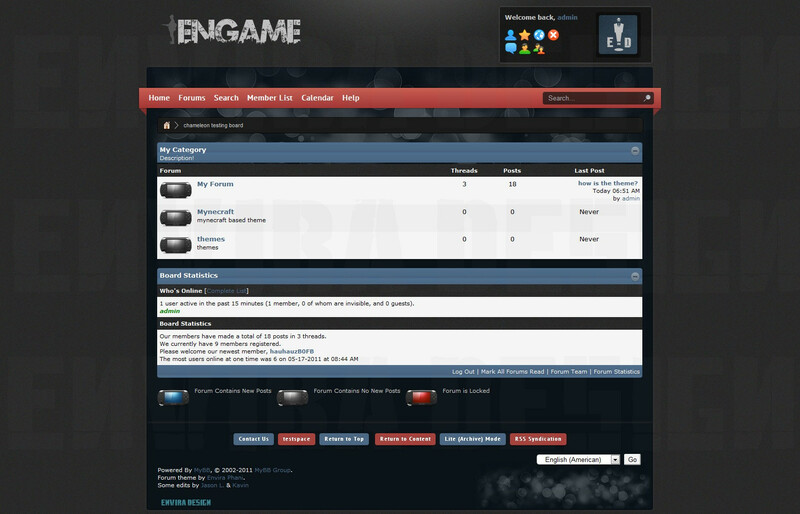 This is perfect theme for Gaming forums,who loves sleek,elegant,professional designs. Quote: 1. Css3 Ribbon menu with custom search-box. 2. Css3 buttons with hover effects and gradients. 4. Custom welcome block panel with icons. 5. Added Tool tips with jquery compatible with theme. 6. Footer has css3 buttons for the bottom links with varied colors. 7. Custom Google fonts added. 9. Boquet design in container and footer. 10. 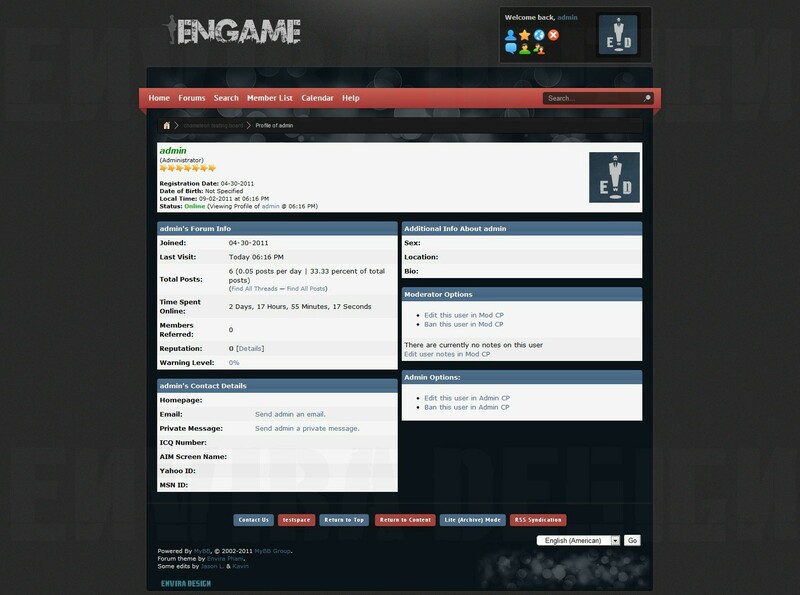 Custom star sets and star image for usergroups. You may not share,redistribute the theme. The Regular theme is priced at 8USD or 8$USD for a single theme. For copyright removal it is 10$ or 10$USD extra,totalling at 18$ or 18$USD. 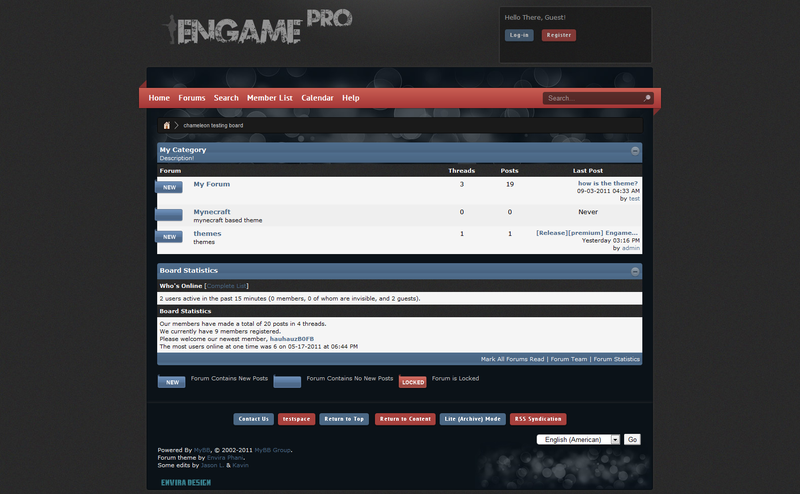 As the theme "Engame-Gamer" was released,2 days ago,i wanted to make it used for all forums.So i made some changes in the engame theme and releasing it as "ENGAME-PRO",which suits all the forums. 11.Hover effects on links,text as well the logo,userpanel which is css3 based. 12.New On,Off and Offlock icons. The license of theme is included within theme folder. 1.This theme is only for personal use. 3.No one can sell the theme,or redistribute it. 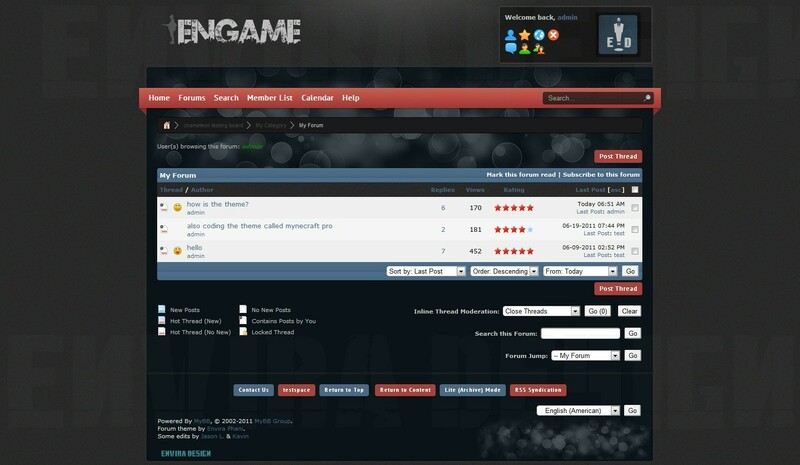 4.Buy purchasing the theme you will have the ownership of theme and 5.will be granted for firs two updates for free. 6.You cannot remove copyright of the theme,which can be done only after purchasing the copyright removal rights. Hello guys,i have been making game themes,of which "Mynecraft" theme based on minecraft game which was released for free as a basic version is one among them. Now i extend the basic theme with more core edits as well texture changes,now i am releasing the premium version called "Mynecraft Pro".This is a professional Dark colored Rgba colors based theme,which is for first time made in mybb. This theme is made with atmost care for more than 3 months of coding untiringly. This release now is a normal post bit theme,and the classic postbit version will also be released,later. The best part of the theme is the jscript based texture changer,where all the textures and background will be changed on a single click. 1.This is a premium theme,so it should be owned by purchasing the theme. 2.You should use the theme for your personal use. 3.You cannot redistribute,share,rip the theme or use its features in oyhr themes. 5.First Two upgrades of the theme would be provided for free. 6.You cannot remove the copyright of the theme,if you want it removed pay for copyright removal. 7.you cannot rip the theme. Any violation of the above rules would be liable for Legal prosecution. 2.Icons from : Minecraft wiki and from game. The Regular theme is priced at 15USD or 15$USD for a single theme. For copyright removal it is 10$ or 10$USD extra,totalling at 25$ or 25$USD. Support will be provided here for all theme customers. Support includes only the bugs within theme and problems faced in theme installation and theme usage. Support does not include any custom edits. How to buy the theme ?? Inorder to order the theme copy the form proforma below and PM as said above. 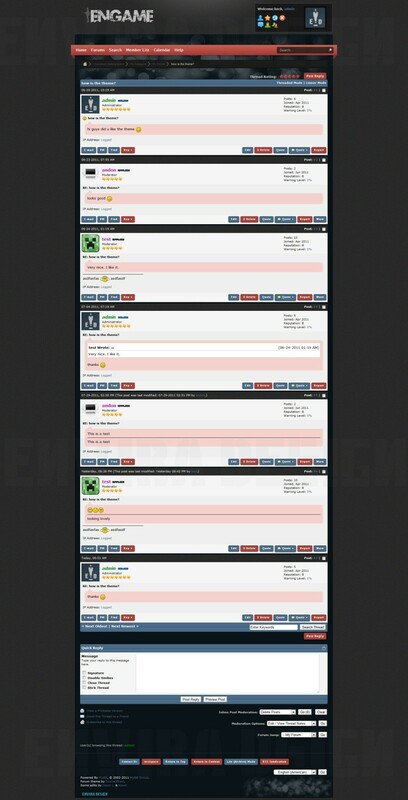 For those who rip the theme,I request you to please not to rip this theme and make this theme R.I.P'ed. If any rips were found we would take legal actions on your site as this is licensed under creative commons 3.0. 1$ from each copy of theme bought will be donated to sites helping for development of MYBB and its resources. So if you like the theme just feel free to give us a testimonial. So I can share the theme once I pay for it? Because for what I understand, creative common license allow me to do it. I don't think is good enough to be premium. (09-02-2011, 07:44 PM)Sama34 Wrote: [ -> ] So I can share the theme once I pay for it? (09-02-2011, 07:48 PM)Mr.tnr Wrote: [ -> ] I don't think is good enough to be premium. Its 1000x better than your mockups,anyways thanks for your opinion. I mean that the license you use, is not the best for a premium/paid theme imo. (09-05-2011, 12:05 PM)Jordan L. Wrote: [ -> ] Not premium standard, imo. Who set's the standards for Premium? Its the designers wish. The customers.. no one's going to buy a big-lime turd that's marked "Premium" by the dude who took it.